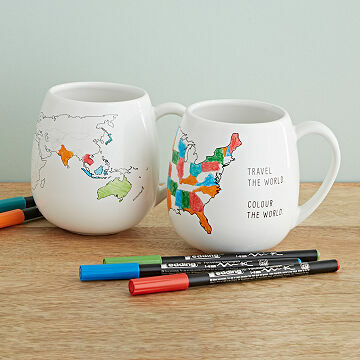 Reminisce about your travels or plot your next destination with this color-it-yourself map mug. That little café in Milan where you sipped espresso. The café au lait in Paris that made you contemplate French citizenship. Remembering those international excursions over a warm cup of joe is a nice way to spend time between trips. Chart your travels by coloring in the countries you've visited on this ceramic mug, then pop it in the oven to permanently update the map. Already have your heart set on your next destination? You can keep coloring as you explore the world, then bake each time to set the ink. It also makes a thoughtful gift for a travel companion or jet-setting friend. Designed by Candelaria Reymundo Santos and Greg Waloszczyk. Made and hand-finished in Poland. One green marker included. Additional colors sold separately. Candelaria Reymundo Santos and Greg Waloszczyk have been traveling the world together since 2008, and as "big tea drinkers" they picked up a lot of souvenir mugs along the way. It was on a plane on one of their adventures that they got the idea to create a mug that let them commemorate all of their travels in one souvenir. As the couple puts it, "He is the business guru and she is the creative mastermind." Even though they left their old lives behind when they decided to travel and explore, they knew they wanted to do something meaningful along the way. They founded their business with the goal of always putting working conditions and quality first, manufacturing their products in Europe, and partnering with dedicated people who are the best at what they do. Leave design to dry for 15 minutes before baking at 320°F in a pre-heated oven for 25 minutes. Leave to cool in the oven. Mug is dishwasher and microwave safe. Bought it so we could use it to cross off our bucket list travels. Plan on buying it for my married children for the same reason!! I love this mug!! I don't put mine in the dishwasher or microwave just to make sure to preserve it. It has been fun coloring it in and always a reminder for the great trips we have taken. Would have liked more colored pens to have been included instead of having to buy a whole set. I hope this works. My other son and his wife are US travelers except for the Caribbean so I am giving one to them. My daughter, with my encouragement, has been to 47 states but is traveling some internationally, so she gets the world cup. Hope they appreciate them. I really like the concept of the mug and that you can add color as you travel. The only negative are the markers that leave streak marks. It does not make a smooth finish. It is difficult to get the color to look nice. If you go over it again, it moves the color instead of filling in. Overall, a unique mug and fun to fill in with your travels. A good conversation piece. Arrived with only one marker. Great idea for travelers to color the places they visited, but arrived with only 1 green marker. Disappointing. Product is very nice! The ability to choose your own colors compliments our wall-mounted scratch-off map, which she loves to have on display. The mug is nice for her to sit and ponder with. The only downside is lack of included pens. This mug would have been a perfect gift but it didn't work - once colored you are supposed to put it in the oven to set the colors, but it didn't work. The color chipped off. Otherwise, it was great.